iSpring: Tell us a little about yourself. Anna: I am a Faculty of Life Sciences graduate of The University of Manchester. Following the completion of my final year project (which I completed using iSpring) with the faculty e-Learning team, I now work with them to create, deliver and support active and engaging learning with our students. 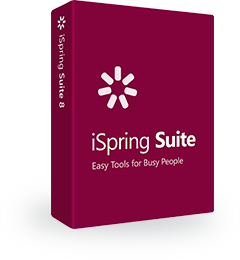 iSpring: For what project did you consider iSpring as an authoring tool? Anna: I used iSpring to create an e-Learning revision resource, which aimed to support second year life sciences students when revising the topic of myeloid leukaemia. The project was testing whether interactive online revision resources could significantly improve students’ knowledge of a topic. The revision package took users through stages, progression, prognosis and treatments of chronic and acute myeloid leukaemia. It incorporated narrated animations, as well as linked publications and videos for extra reading and extensive notes. At the end of the resource there was a quiz which the user could use as a self-testing method to see how much they had learnt about the topic. iSpring: What are the benefits of using iSpring/what features did you like best? Anna: iSpring was extremely easy to use alongside PowerPoint. All the features were accessible and self-explanatory, and I found the online help guides very useful when finding out if certain things were possible, such as sending quiz results to an email address or server. My favourite feature of the PowerPoint add-on was the Narration Manager, as it was incredibly simple to create and sync narrations together with the animations without having to work out specific timings. One of the advantages I found when using iSpring compared to other e-Learning software is that you can build a branched resource and are not forced into creating something linear. Everything you do in PowerPoint (hotspots, triggers, hyperlinks, animations, transitions etc.) is published with the iSpring resource, which is one of the best features of this product. iSpring: What were the challenges? Anna: Creating animations in PowerPoint was the most time consuming task when building the resource. Narrating the resource was somewhat a challenge as I had to narrate the full slide in one go, most of which were quite long and had a lot of text. I used another piece of software (Audacity) to record and edit the narrations and then imported them into my iSpring resource so I could sync them with the animations. iSpring: Do you have any highlights from your experience with iSpring? Anna: The recent addition of iSpring Cloud has been the highlight as it is the perfect place to host and share a resource you have built. The PowerPoint add-on can publish straight to the cloud, so once you have shared a link it remains live and updates can be seen immediately. I think this is a very useful tool if you are collaborating with others on the creation of resources. iSpring: To whom would you recommend iSpring? Anna: I would recommend iSpring to anyone wanting to create interactive and engaging e-Learning resources. It is perfect for anybody who has PowerPoint skills, both advanced and basic. Specifically, I think it is a brilliant way for academics/teachers to create self-paced revision resources for their students. These can cater to multiple learning styles as well as providing the students with the opportunity to self-test. Do you have a success story you’d like to share about using iSpring in business, academia, government, or any other sphere? Contact us today, or leave a comment below!